Weight loss surgery is a major procedure offering a tool to lose weight effectively and long-term. With our experience of helping thousands of patients, Mexico Bariatric Center offers monthly seminars to help people get their lives back! Sign up for our upcoming free bariatric seminars here! Mexico Bariatric Center is a leading educator about obesity and surgical treatments for obesity. 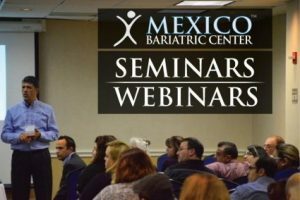 Mexico Bariatric Center regularly holds monthly seminars and webinars to better educate people about our bariatric services and about bariatric surgery benefits. During our seminars, we regularly hold drawings and special promotions. In fact, we’ve already given out several surgeries at Promotional Discounted Prices to selected winners. By attending our live event, or by watching it on our accompanying webinar – you’ll be able to get your question answered by our expert team. We hope to see you at one of our upcoming events! Phoenix, Arizona Bariatric Seminar 10/13/2018. Houston Texas Bariatric Surgery Seminar 9/18/2018. Fort Mcmurray, Alberta Bariatric Surgery Seminar 07/2018. Edmonton, Alberta Bariatric Surgery Seminar 07/2018. Portland, OR Bariatric Surgery Seminar 06/09/2018. Baton Rouge, LA Bariatric Surgery Seminar 04/28/2018. Bariatric Surgery Seminar Salt Lake City, UT 03/03/2018. Atlanta, GA Bariatric Surgery Seminar 01/20/2018. Seatac, WA Bariatric Surgery Seminar 05/2017. Calgary, Canada Bariatric Surgery Seminar 07/22/2017. Tulsa, OK Bariatric Seminar 04/22/2017. Arlington, TX Bariatric Surgery Seminar 05/27/2017. Houston, Texas Bariatric Surgery Seminar 02/11/2017. New Orleans, LA Bariatric Surgery Seminar 11/5/2016. Portland, OR Bariatric Surgery Seminar 10/15/2016. Bariatric Surgery Seminar Edmonton, Alberta 08/27/2016. Dallas, TX Bariatric Surgery Seminar 05/25/2016. Salt Lake City, UT Bariatric Surgery Seminar 05/14/2016. Los Angeles, CA Bariatric Surgery Seminar 04/02/2016. Oklahoma City, OK Bariatric Surgery Seminar 02/28/2016. Tulsa, OK Bariatric Seminar 02/27/2016. Seattle, WA Bariatric Surgery Seminar 10/24/2015. Baton Rouge, LA Bariatric Surgery Seminar 06/27/2015. Houston, TX Bariatric Surgery Seminar 01/31/2015.